All together Henry the Young King had four nephews named "Henry". Each of them, quite obviously, used a different variation of the name dependable on the country he came from*. Henry the Young King met only the first two of his nephews: Henri II, Count of Champagne and Heinrich, Count-Palatine of the Rhine. The oldest "Henry" was Henri II, Count of Champagne, King of Jerusalem, born in 1166, as the eldest son of Henry's half-sister Marie and her husband Henri I 'the Liberal' Count of Champagne. His father died in 1181 when Henri was fifteen, leaving Henri's mother to excercise the comital office as regent for their son for six years (1181-1187). Henri was bethrothed to Isabelle of Hainaut in 1171, but her father did not keep the word and married her off to Philippe II of France in 1180, which resulted in the family tensions-- Philippe's mother, Adele, was Marie's sister-in-law and opposed the Hainaut marriage. Marie supported her in-laws against the young Philippe, who was under the influence of Philip of Flanders at the time. Henri must have met his uncle, Henry the Young King on various social occasions, such as tournaments or banquets. When he reached maturity and assumed the countship in 1187, his mother decided to retire to Fontaines-les-Nannes, a Fontevrist priory near Meaux, taking with her her second son, eight-year-old Thibaut. The fall of the Holy City, however, made Henri, as many young men at the time, take “the Jerusalem road”. In 1190, before he set off at the head of a large contignent of barons and knights on the Third Crusade, he summoned his barons and knights to Sezanne to swear oaths of fidelity to his twelve-year-old brother Thibaut in the event that he himself did not return from the Holy Land. Upon his departure Marie resumed the office of a regent. She could not have known she would never see her son again, for “... although all the kings and princes returned from there to their own lands, he remained there as if alone, and received through a certain marriage the kingdom of that land, the wealth of which seemed greater than his own regions’(Chronicle of Hainaut, pp.139-40). ‘A certain marriage’ meant Henry’s marriage to Isabella, daughter of King Amaury I of Jerusalem and widow of Conrad of Montferat, whom Henry took as his wife on 5 May 1192, eight days after Conrad's murder. Henry refused the title of king, styling himself ‘lord of the kingdom of Jerusalem’ and to the very end ‘count of Champagne'. He died tragically on 10 September 1197 in a bizarre accident, falling from a window of his palace at Acre. Was it a window or balcony railing that gave way under his weight? The accounts differ when it comes to details. One thing is certain, though: at the time of his death Henry was thirty-one, too young and promising man to die. From his marriage to Isabella he had three daughters: Marguerite, Alice and Philippa. After his death his mother Marie continued as regent for his younger brother Thibaut until she died in March 1198. Heinrich (1173-1227), Count-palatine of the Rhine, was the eldest son of Henry the Young King's sister Matilda and her husband Heinrich der Lőwe of the Welf dynasty, duke of Saxony and Bavaria. In 1182, a year after his father lost his imperial fiefs as a result of his clash with Emperor Frederick I Barbarossa, a nine-year-old Heinrich, together with his elder sister Richenza/Matilda and younger brother Otto [later Otto IV Holy Roman Emperor] accompanied his parents when they went into exile into the lands of Matilda's father, King Henry II of England. Heinrich must have been an eyewitness to the fierce family quarrel that ensued during the Chrismas court of 1182 at Caen and the clash of wills between his uncles, Henry the Young King and Richard, Duke of Aquitaine [later Richard I the Lionheart], the events that led to the war of 1183 and to the Young King's death. Heinrich and his family spent three years in his granfather's domains. In 1185 he was the only child of the ducal couple to return to Saxony with his father - Matilda, Otto and little William (b. in Winchester, England, in 1184) remained behind at the Angevin court. Little wonder that 1190 saw him the key figure alongside his father in Saxony. In February he was sent as his father's representative to his uncle Richard I at La Reole (Gascony) to discuss the Saxon affairs and to ask for the latter's assistance. Similarly when elder Heinrich negotiated agreement with Barbarossa's son and successor Emperor Heinrich VI, he offered his son Heinrich (alongside with his other son Lothar) as hostage. In 1194 Heinrich married Agnes, the daughter and heiress of the Staufen count-palatine Conrad of the Rhine. A year later both his father and his father-in-law died and Heinrich inherited not only the most important rights and properties in Saxony, including the principal residence of Brunswick, but also became count-palatine of the Rhine. During the subsequent years, however, he focused mainly on securing his Saxon inheritance. In 1198 he might have been elected king and emperor instead of his younger brother Otto, the only emperor of the Welfen dynasty, if he had not been crusading in the Holy Land at the time- he left early in 1197 only to return in the autumn of 1198. After his return he found himself entangled in the civil war that yet again engulfed the German kingdom. Initially he supported his brother Otto and was "always in all matters the better part of the king's council", as was reported in a letter to Pope Innocent III in 1201. In 1202 he agreed to create a lordship for Otto out of his Saxon lands, even acknowledging his younger brother's control over the Welf's chief town of Brunswick (the so-callled Contract of Paderborn). Otto spent most of his youth in the Angevin domains inheriting a small portion of his patrimony, that is why he badly needed the stable territorial foundation for his kingship. Heinrich was ready to provide him with it. 1204, however, saw him switching sides and pledging loyalty to his brother's opponent, the Staufen king, Philip of Swabia, the youngest son of Frederick Barbarossa. As the author of Chronica regia Colonienisis relates, "the unfaithful count-palatine, who was at his brother's side, abandoned him and went over to Philip, corrupted by his money and the promise of the duchy of Saxony". The reason for this defection must have been Heinrich's weakened position in Saxony after the afore-mentioned partition. Arnold of Lübeck, however, gives a little bit different account of what happened. According to him Heinrich was warned by Philip of Swabia that he was to loose the title of the palatine of the Rhine unless he joined the Staufen camp. Heinrich sought compensation if that were to happen and asked Otto to give him back the castles of Brunswick and Lichtenberg. Otto was to refuse flatly, thus pushing the elder brother into defection. Although Heinrich never actively plotted against Otto, he did something shocking by the standards of the day, for few noblemen of the Staufen period sided with another lord against his own brother. Pope Innocent III, at the time Otto's active supporter, wrote to Heinrich, hinting that the latter was even risking excommunication, but Heinrich - as it seemed - did not care. The brothers were reconciled in 1208, after Philip of Swabia's assassination. They were to maintain close ties with one another until Otto's death in 1218. Heinrich died nine years later, having set up his nephew Otto "the Child", the son of his brother William of Winchester, as heir of the entire Welfen domains. The Brunswick Lion (c. 1166), symbol of the Welf family, the oldest, preserved large sculpture from the Middle Ages north of the Alps and the first large hollow casting of a figure since antiquity. Courtesy of Ms Gabriele Campbell. Enrique I (1204-1217) the son of Henry the Young King's sister Eleanor/Leonor by her husband Alfonso VIII of Castile, born on 14 April 1204, exactly thirteen days after his maternal grandmother Eleanor of Aquitaine's death. Enrique's parents both died in 1214 when he was eleven yars old, thus still a minor. Leonor outlived her husband by only a few weeks. Before she died she "had comitted both the kingdom and her son and all the legal rights to the kingdom, just as the lord king of blessed memory had comitted them to the same Queen Leonor", to her eldest daughter Berenguela (1180-1246), the former queen of León. Following the Castilian custom Berenguela, herself her father's heiress-presumptive, became Enrique's regent. She held the custody, the 'tutela', of her brother with Archbishop of Toledo, Rodrigo Jimenez de Rada and Tello, bishop of Palencia, sharing with them the reigns of governement. Immediately upon his accession young Enrique received the homage of the nobles of the realm. Unfortunately, Berenguela's tutelage and regency did not last long. Already in 1215 she was forced to turn the regency of both Enrique and the kingdom to Count Álvaro Núnez de Lara and thus lost all influence at her young brother's court. The loss of power was accompanied by a civil war. As events unfolded, Enrique, a true puppet, was to remain in Count Alvaro's hands until his tragic death. Before it happened, his sister made unsuccessful efforts to inflirtate his court. The count tried to exercise even more control over the boy by arranging his marriage to Portuguese princess Mafalda. The marriage, however, never consummated was soon dissolved by Pope Innocent III on grounds of the couple's consanguinity. Young Enrique died in the late May 1217 in the city of Palencia from a wound to the head. He was fourteen. According to the sources, he and other young boys from his household were playing unsupervised on the roof, when someone threw (or kicked) a loose roof tile and accidentally wounded the king that way. The efforts to keep the boy alive by trepanning proved unsuccessful. He died a few days later. Count Alvaro unsuccessfully tried to supress the word of his death by hiding the body in the tower of Tariego, near Burgos. Berenguela, however, quickly received the news and managed to retrieve the body, which she later took to Las Huelgas to bury it near their parents at the abbey that their father Alfonso founded at the behest of their mother. "She caused to be out there a very nobly adorned coffin, and she buried him there, near her brother Infante Fernando, performing the offices of the holy church thoroughly and very honorably in his burial, with great lament and sorrow and many offerings, all royally and acomplshed with much nobility" (from Primera crónica general). Upon Enrique's death Berenguela's son Fernando (1199-1252) was recognized as king. 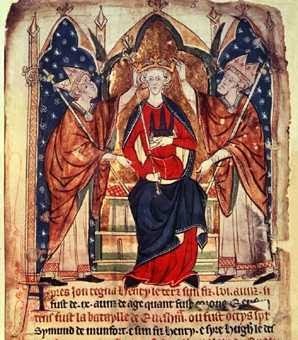 The afore-mentioned Henry III (1207-1272), king of England, was the youngest of Henry the Young King's nephews and namesakes. The son of Henry the Young King's brother John (b. 1166) by his second wife Isabelle d'Angoulême, he inherited the throne as a nine-year-old upon his father's death in 1216. England was in a state of civil war at the time. Council of regents was appointed, headed by William Marshal to rule in the name of the child king. In 1216 time seemed to come full circle: it was William Marshal after all who took care of the Young Henry when he became king in 1170, guiding him into manhood. In 1216 he was taking care of his former lord's young nephew, who needed care and guidance as badly as his uncle forty-six years before him. Henry III began to rule in his own right in 1234 and as we all know his reign turned out to be a period of weak government and rebellion. Little wonder, his autocratic apporach, favouring his Provencal wife's relatives over native barons and lack of political and military skill led to the inevitable crisis, and the bloody clash between Henry and his brother-in-law Simon de Montfort. On the other hand Henry was a sensitive and cultured man who left a splendid legacy- Westminster Abbey in the shape we can admire it today. * I wonder what form of his name Henry the Young King himself used in his lifetime. He was Anglo-Norman-Angevin, after all. Fascinating post Kasia! So much history there. I'm always interested in reading about the Count of Champagne; what a waste of a life, dying so young so tragically. As for Henry III, it was a pleasure to see for myself his great legacy. You have a talent for pulling together fascinating history into a unified post. Very enjoyable & you always inspire me to more reading! Thank you so much, dear Joan! What heartening and encouraging words. Much appreciated. My next post is on the way, this time dealing with Henry's sister Matilda, mother of both Heinrich and Otto. I am planning to finish it before Christmas break. Hadn't really thought about the connection of William Marshal with the Young King and the very young king Henry III. A very thought provoking post Kasia. And as well as Westminster Abbey, let's not forget the extensive building at the Tower of London Henry III did. Thank you for your comment, Anerje! Henry was indeed a great builder plus a good husband and father. As for William Marshal, he was to say: "By God's sword, if all abandoned the king, do you know what I would do? I would carry him on my shoulders step by step, from island to island, from country to country, and i would not fail him not even if it meant begging my bread". And this is what he precisely did, didn't he? Not only for young Henry III, but for all the Angevin kings he had served. BTW, you are welcome to add a photo of the court in Brunswick (Dankwarderode) or the cathedral from my blog as well. Thank you, Gebriele! Much appreciated. I've always thought that Henry III was a bit like King Stephen, almost to nice to be King and very stubborn in the wrong places. I've always read that he was very close with the family. He apparently was. His disabled daughter comes to mind. Her untimely death left both Henry and his Queen heartbroken. By the standards of the day they were really extraoridinary parents. it's worth noting that it was Edward I, when he was still a Prince, who defeated Simon de Montford, not Henry III as well. Indeed, but let's not forget who the disgruntled barons were waging war against. Not against Lord Edward, although he was the real power behind the throne at the time. At Lewes in 1264 Henry was the main target of the barons' army, or wasn't he? Kasia, I think I love Henri II of Champagne as much as you love Young Henry. ;) The more I read about Otto and Heinrich the more fascinated I am. Thanks for another excellent blog post. Thank you, dear Emilie! I find all of Henry's nephews fascinating, even the young Enrique, or perhaps rather - to be more precise - the turbulent era he lived in. Excellent post Kasia! Although I'm not sure I would call them his namesake, they would have been Henry II's namesakes as I'm pretty sure they would have been named for their grandfather and not their uncle... ;) Seems like none of them were very lucky and only mildly successful. More similar to Henry the Young King than Henry II then? Henry the Young King was the only king of England crowned in his father’s lifetime. In this his father, Henry II followed the continental tradition. The Capetian rulers had their heirs crowned during their reign in order to avoid even a momentary interregnum and disorder. Louis VI, for instance, still active monarch, had his son, also Louis, anointed in Rheims cathedral already in 1131. It was not until 1137 that Louis began his independent rule and only upon his father’s death. The same Louis had his only son, Philip crowned in 1179, a year before he himself died. Today I would like to introduce a few facts about Henry the Young King everyone should know. Henry the Young King Says Thank You!